Three years ago, Errick McCollum was playing in the second tier of Israeli basketball. 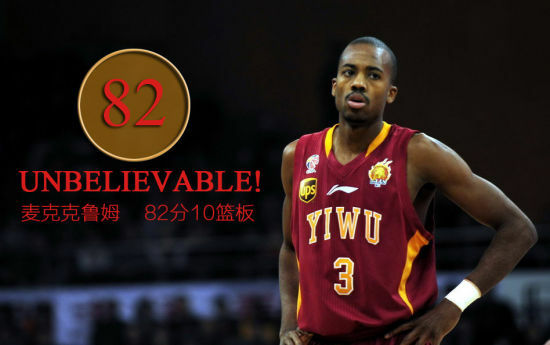 Last night, he scored 82 points against the Guangdong Tigers to break the record for most points in a CBA game (75, set in 2012 by Quincy Douby). That was his fourth game of 50 points or more in thirty-seven games. With one game left in the season, McCollum is averaging 39.6ppg and barring some kind of mathematical improbability, the point guard will also shatter the record for most points in a CBA season of 35.2ppg set by the former Xavier center Anthony Myles in 2006. On the one hand, this is great for McCollum, who having led both the Israeli and Greek first divisions in points before arriving in China, will probably also leave the Middle Kingdom with a third successive scoring title. The twenty-seven year old, whose brother CJ currently plays for Portland, has been hustling hard to get in the NBA for a while and these kind of numbers (albeit in semi-credible leagues) make it increasingly hard for an NBA GM to not think about taking a gamble. Its also impossible not to get behind a story about a player from Division II Goshen College who goes from playing in a town in central Israel with a population of 86,000 to subbing into an NBA game. For the CBA however, McCollum’s dominance underlines a very real dilemma for them. The last time a Chinese player led the league in scoring was Jilin’s legendary swingman Sun Jun back in 2002 and since then, Americans had slowly monopolized the scoring chart. In the 2005/06, half of the top ten scorers were local but within two seasons only two Chinese players were able to hang with the Americans. 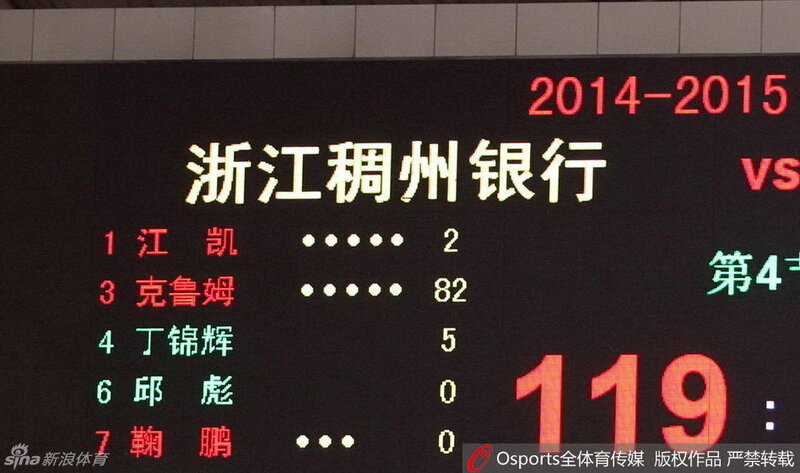 From 2008-2010, only Wang Zhizhi, an all-time great player in China was able to finish in the top ten. Things though changed substantially in 2011 when the highest placed Chinese player on the scoring chart was a thirty-three year old Wang all the way down in 26th place. Understandably, American players are valued commodities in the CBA and in recent years there has been an undeniable shift in terms of how they are used. Within the fifteen year lifetime of the CBA, Americans have gone from being complimentary pieces to almost always being used to carry a team’s scoring. In turn, this had let to teams shifting their offensive focus almost completely onto the foreigners. As a good example of this, its worth looking back to 2011 when the NBA lock-out happened and four notable American players were suddenly up for grabs; Kenyon Martin, Wilson Chandler, Aaron Brooks and JR Smith. During this time, a member of a CBA front office told me that the signing of the thirty-three year old, somewhat ailing Martin was misjudged because (and to paraphrase), ‘you don’t bring an American here to play defense’. The observation rang true; Xinjiang, the team who signed him, had local players who could make up 70% of Martin’s defense but certainly not the same amount in scoring. 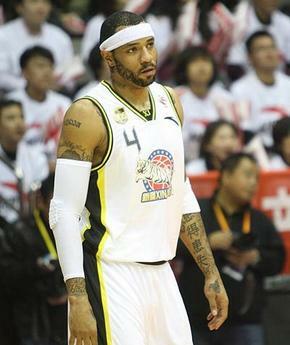 Xinjiang struggled with Martin, who averaged just 13.9 ppg in China and was done after thirteen games. Meanwhile Brooks would average 20.6 points and reach the CBA Finals with Guangdong whilst Smith led the league in scoring (32.0ppg) and Chandler finished with 27.2ppg. The failure of Martin, a much hyped player when he came to China, to Xinjiang, a team that had made the last three CBA Finals up to that point was a line in the sand moment. It demonstrated that a foreigner who could provide NBA calibre defense wasn’t going to help anyone in the CBA. An outright 28-30 points a night scorer or a 20+ 10 big man were going to be only acceptable currency going forward. This season though, scoring have reached a new peak and if the league finished tomorrow, there would be three different players who would have smashed Myles’ record; McCollum, Chongqing’s Willie Warren (38.9ppg) and Jilin’s Dominique Jones (37.8ppg). Ironically, the reason for this may well be because of the very measures the league put in place to stop foreign players taking over the game. Back in October, the CBA announced that for this current season onwards, only one American per team would be allowed to play in the fourth quarter. This was done in an attempt to spread the ball around but what appears to have happened is that teams have gone heavy with both their foreign guys in the second and third quarters and then hand the ball over exclusively to one go-to American (typically the guard) in the fourth. If one looks at the scoring chart for this year, the first Chinese player to appear on the list is Yi Jianlian in 16th place. After that, the second highest local scorer is Guangdong’s Zhu Fangyu in 42nd place and third, Jiangsu’s Chang Lin, is in 57th place. The CBA, which has always been a place where defense comes to die, is now in a brand new age of scoreboard bothering numbers, both on an individual and team level. Between 2008-2014, four teams averaged over 110ppg over the regular season. This year, eleven (eleven!) CBA teams will finish the year averaging that amount or more. This is obviously unprecedented and for the casual viewer who loves shoot-outs and dudes going off for fifty, the CBA really should be your league. The deeper issue though is that the majority of scoring is being generated by the foreign guys. This might be fine on a domestic level but as far as the rebuilding Chinese national team is concerned, something has to change because its’ new generation simply aren’t getting the same number of shots or the chance to lead an offense that their predecessors got. Remember, the country’s best young players lost to basketball minnows India on Chinese soil less than a year ago. Now the league has another tricky decision to make. If it wants to bring the Chinese guys into the game more and ultimately produce a better quality of national team player (which was technically the founding goal of the CBA all along), deeper cuts will need to be made to the rules on foreigners. In doing so, it might hinder a team’s chance to sign popular Americans like a Stephon Marbury, a JR Smith or a Michael Beasley but with time, it might also help unearth a new Chinese scorer with the same ability as Sun Jun. One radical solution might be to limit teams to one foreign player who can only play in three quarters or not at all in the fourth. That though would be the nuclear option but something this extreme will have to happen if the league is to shift back to its earlier days when Chinese players were making the headlines. Ultimately the league still needs American players and one might argue that the reason why all-time Chinese greats like Wang, Yao Ming and Mengke Bateer all became as good as they got was because they were able to test themselves against Americans as they came up through the CBA. But radical changes will need to be taken to restore the balance. Some of that is through altering the rules, a lot of it is still about overhauling coaching practices and the selection of young players. Even if they started to tomorrow, it would take decades to fully see the changes. In the meantime however, it’s still important to let McCollum, who has been a lot of fun all season, have his moment. Shooting of this magnitude doesn’t happen very often and the Chinese media are quite rightly lapping it up. The reality though is that the CBA and Chinese basketball still need to figure out how to ensure the next record breaking scorer is from Nanjing or Shanghai rather than Canton, Ohio. To be honest I’d keep it how it is To some degree. Steel sharpens steel and all that. Sooner or later we’ll see the next wave of Chinese guards moulding themselves on the imported talent. I would let every team have two imports plus one Asian import and have the rule only two on the court at any one time for all clubs. As you say, the CBA is a fun as hell league to watch.